Clint Eastwood doesn't make bad movies, though he rarely makes exceptional ones. However, his American Sniper is not just a movie. It's a phenomenon, grossing $105 million in its opening weekend -- greater than the total take of most Oscar-nominated films this year -- and earning six Oscar nominations to boot. In an era when franchise-happy Hollywood studios seem most interested in catering to game boys and comic book freaks, Sniper is a film event that is bringing a rare cross-section of the American public out of the Netflix shadows and into the Cineplex. In the packed AMC Century City 15 in which Mariana Correch and I viewed the movie Wednesday night, there were only a few empty seats. Moreover, as the silent credits rolled, I checked out who was waiting until the end. In L.A., those who stay through the credits are usually industry wannabes looking to see who was credited, location freak/travel writers like myself ascertaining where the movie was shot (in this case, mostly Santa Clarita and Morocco), and/or diehard fans of the flick. As I surveyed the stragglers, I spotted a healthy dose of solitary, white, middle-aged men, one of whom made a concerted attempt to continually mumble aloud what a "great, great movie" we all had just witnessed. Unfortunately, American Sniper is not a great movie. Kathryn Bigelow's 2009 Oscar-winning Hurt Locker captured the emotional reality of the Iraq War -- and its home front consequences -- with sharper acuity. And films like the underrated Body of Lies and the documentary Restrepo give a more nuanced and insightful take on what we are dealing with in our fight against radical Islam. In fact, American Sniper is not even in the top 10 movies I saw last year. Moreover, there is zero chemistry between the two leads, a serviceable Bradley Cooper (who plays navy SEAL sharpshooter Chris Kyle) and whiny one-note Sienna Miller (who plays his hot, but unhelpful and weirdly un-sympathetic, wife Taya). Their romance and marriage rings hollow in Eastwood's otherwise able hands, though Cooper's stoic approach to both home and war rings wise and true. In a surprise for this normally efficient filmmaker, the movie is also 20 minutes too long. With all that said, millions of moviegoers -- many of whom are peeved by our president's subtle condemnation of the Iraq War -- are vehement in the film's defense. And they are saying as much with their pocketbooks. And I can tell you why. American Sniper might be the first film that shows U.S. soldiers fighting in Iraq as war heroes. And that is a welcome turn indeed. 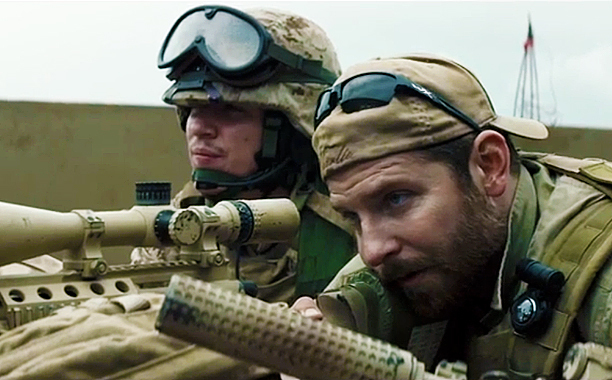 Unfortunately, American Sniper doesn't do much more than that. Though it does show a few "sensitive" soldiers questioning the moral premise of the disastrous Iraq imbroglio, these feeble voices are quickly dispatched like so many ghutra-clad jihadists. The message for this education columnist was clear: critical thinking gets you killed. As a result, we don't come away with a new moral foundation for the Iraq War, or even a questioning of the deliberate lies and disinformation that buttressed it. Nor do we get a glimpse of "why 'they' fight us" with such self-immolating abandon. There was enough time to show all that, but Eastwood chose blood and guts over deeper reflection. In fact, he so assiduously avoids such discussions, it would be wrong to say the film is unequivocally pro or against the Iraq War at all. What American Sniper does show is the special talent and emotional detachment required to be an effective killing machine (Kyle had 160 confirmed kills, and, by his own reckoning, dozens more unconfirmed ones). Moreover, it turns the Iraq War into an action adventure, with some viscerally entertaining fight scenes (including one impressive sandstorm skirmish). It, thus, effectively sanitizes this dark chapter in U.S. history, making it safe again for the masses to embrace chicken-hawk George W. Bush's deceitfully sold Iraq misadventure. A colossal misstep that not only damaged our soft and hard power around the world, but took our eyes off the ball for six years in Afghanistan, allowed Putin to run wild in Eastern Europe, and made us skittish today to win the fight on the ground against the death-worshipping jihadists in areas where they truly need to be fought. Nevertheless, the film does yield a modicum of compassion for Kyle himself -- spoiler alert -- by showing that soldiers never really leave their jobs after their last tour of duty. We knew that already from a corresponding set of classic Vietnam films: Coming Home, The Deer Hunter, and even Born on the Fourth of July. Where American Sniper breaks new ground is in showing that in this era of asymmetric warfare -- and concomitant rash of PTSD victims -- there is no safe harbor, at home or abroad, even for someone as brave, stolid and effective as Chris "The Legend" Kyle.